We received a response from Mayor Ro of Seoul Gangseo-gu regarding our campaign “Friendship City Campaign – Seoul Gangseo-gu, South Korea – Nottingham, United Kingdom”. We had already closed this campaign but nevertheless, it had made a positive impact by raising awareness about this issue with the City of Nottingham, as well as making Seoul Gangseo-gu aware that we are campaigning against their dog meat industry. 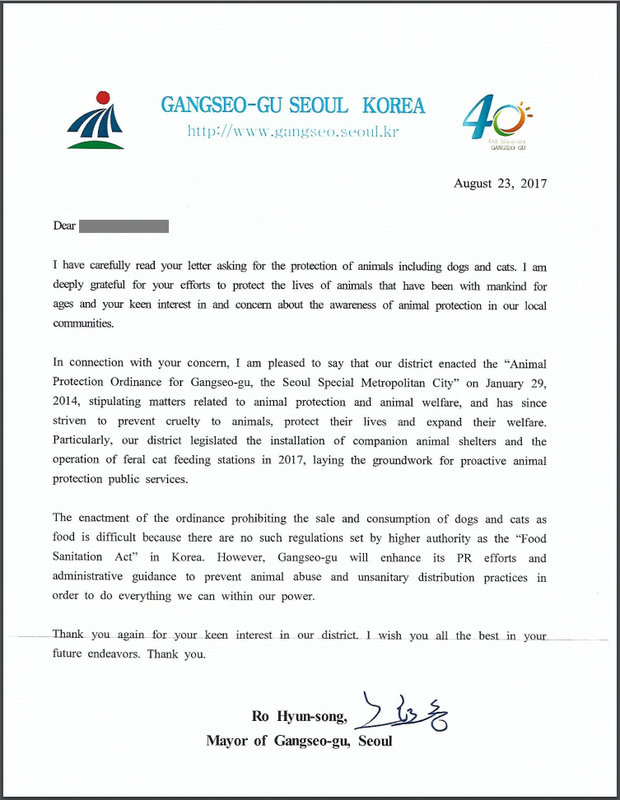 The mayor of Gangseo-gu had stated that they will “enhance PR efforts and administrative guidance to prevent animal abuse and unsanitary distribution practices in order to do everything we can within our power.” However, he doesn’t say that he will take steps to ban the illegal dog and cat meat trade. We must keep our pressure on their government to motivate them to take action to end the horrific dog meat trade. IN EVERY RELIGION, EVERY FAITH, THIS IS WRONG BY ANY STANDARD,START USING MORE COMPASION & MORE OF OUR CEREBRAL CAPACITY. LETS EVOLVE WHILE WERE ALIVE! Sounds like he’s really ready to do at least something. But sorry, Mayor Hyun-Song Noh, we will boycott Seoul and Korea until it goes totally dog-meat-free. It took only 4 years for Thailand to ban and stop dog meat trade, I don’t believe Koreans can’t do the same. We must keep on safeguarding the welfare of all animals!